It's, oh ,so quiet, it's, oh, so still .... like the lyrics of the famous song, this can be description of Dubrovnik from November to March. Streets are not overcrowded like in hectic summer months, you can easily walk and admire the true beauty of the culture and arhitecture that we inherited from our ancestors. 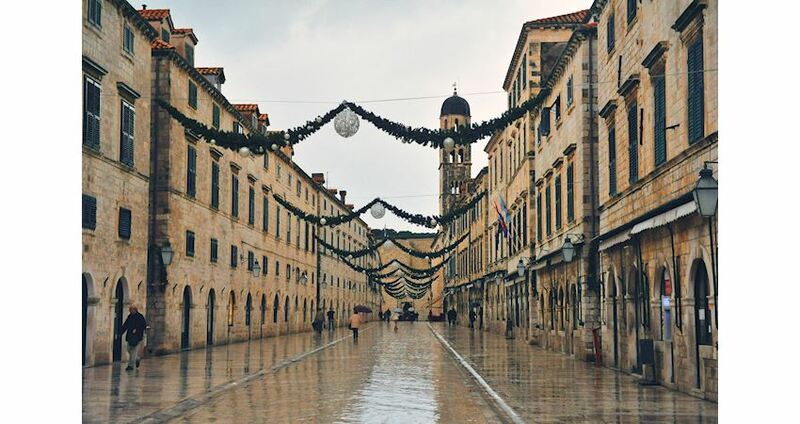 So if you don't like Dubrovnik when it's hot and busy, winter is the perfect time of the year for visiting. Nothing should stop you in that decision as there are still lots of things to enjoy in the city. However if you are a foodie- traveler like us, it can be a challenge to find good places to eat because a lot of restaurants closed their doors in the Old City. Therefore we made a list of places worth visiting, where you will be able to taste some local food but also some „imported“ flavours that influenced our cuisine through the centuries. Those are hidden gems run by local enthusiasts and families not willing to give up cooking after exhausting summer season. This is our random list, not paid advertising Lucin Kantun – if you like to watch how your chef is preparing food just for you, this should be your first choice. They have great selection of tapas and everything is based on local ingredients. Trattoria Capriccio – small restaurant near the Old Port serving Italian influenced dishes, but in November and December they prepare special dishes traditionally cooked in area around Dubrovnik – breaded and pan fried frogs or eel and frog brodetto. Tavulin – it is one of the Michelin recommended restaurants as they are keen to use only fresh seasonal ingredients to present traditional local cuisine. But hurry up as they close December 1st. Taj Mahal – Bosnian restaurant with Indian name but full of good flavours. Their pastry soft pies are especially ideal for the cold winter days. And Sarajevsko beer is also a bonus! Pupica –a small and cosy patisserie where you can stop for a cup of coffee, like locals often do, and taste excellent homemade cakes. Sesame – sometimes just atmosphere attracts us. Ideal place for those who like charm of the French bistros paired with organic food, homemade bread and great desserts. From our experience as travelers we know it is difficult to find the best food spots and sometimes even recommendations on the travel websites are not reliable. That is the reason we want to present you the very best of Dubrovnik cuisine. Stay tuned as in our next blog we'll be in the Christmas mood!